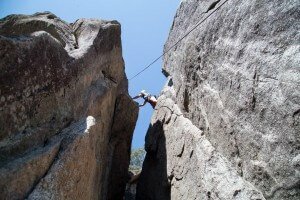 How Challenging is Rock Climbing? 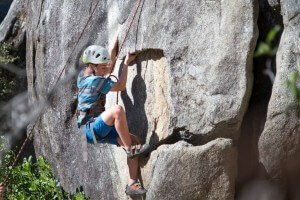 Assigning a grade or rating to rock climbing routes is generally a great way to better understand how one climb might compare to another, and to give you a general idea of if a specific climb or route is going to be too easy, too difficult, or just right for you and your climbing friends. With that said, there is a lot of variability that goes into the true difficulty of any given climb. For example: a climber might find a 5.9 crack climb easier than an equally rated 5.9 face climb simply because they are better at one style of climbing than the other. Face Climbing: climbing the steeper “face” of the rock as opposed to a crack system or chimney climb (Lunge and Ant Hill). Slab Climbing: a slab climb is a type of face climb. It refers to smooth rock “slabs” with an angle of 50 to 75 degrees, which are lower angles than standard faces. Both face and slab climbs require the use of most climbing techniques (Knobby). Crack Climbing: crack climbing has two basic types; a crack that goes straight in and up on a flat wall or a crack running the length of a corner where two walls meet, such as the corner of a room (Lay Back). Crack’s can come in different sizes, from large fist cracks, to hand sized or even finger sized cracks. Chimney: imagine you are Santa Clause. You have just finished delivering presents and now you need to go up the chimney back to your sleigh. This is what chimney climbing is like. You will be putting your whole body into the “chimney” (basically a large crack) to shimmy your way up (Chimney). Depending on the size of a hallway you can also chimney up hallways back home. Knob: a “knob” is a piece of rock on a face like a door handle. It can vary in size being as small as a marble or bigger than a bowling ball. Lay Back: this is a type of climbing move that is self descriptive. The climber will have their arms out stretched and they will be “laying” or “sitting” back and hanging on their skeleton as they make their way up the rock. Thin Holds: this is a way to describe hand holds that are very small and may require you to use only your finger tips. Roof: a part of a climb that has an overhung ledge or “roof” that goes above the climbers head that they need to get over. Arete (uh-ret): two walls coming together and pointing out away from the main wall in what looks like the bow of a ship is called an arete. Crux: refers to the hardest part of a climb; usually is only a few moves but often determines if you’ll make it to the top or not. Knobby 5.6 – A moderately steep slab climb with large hand holds. This is an easy first climb and great for beginners! Ant Hill 5.7 – If you still want something easy as you try your hands at rock climbing Ant Hill would be the next step! The first few moves are the hardest part because it is slightly steeper. After this it becomes easier because it is less steep and the holds become larger. Most everyone achieves the top of this climb! Lunge 5.7 – Of the rock climbs at Rock-N-Water this would be the moderate range climb with several different types of climbing combined in it. About half way up there is the famous and surprisingly fun “lunge” move. 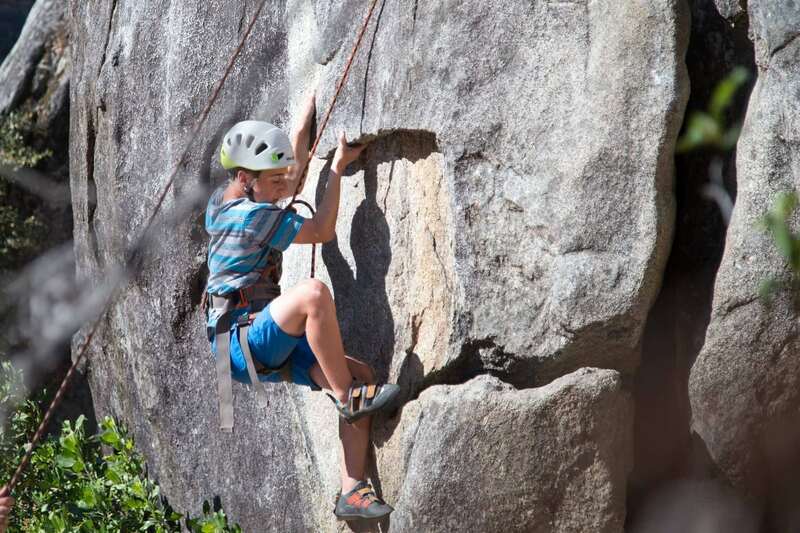 The holds and moves on this climb are somewhat more advanced and require a little more problem solving making the perfect challenge even to those rock climbing for the first time. Lay Back 5.8 – This is a great introduction to crack climbing and is one of the more advanced climbs at Rock-N-Water. When climbing Lay Back the climber will need to learn how to do more challenging crack climbing moves because the are no specific hand holds on this climb. You are climbing the crack alone! Chimney 5.8 – This is a favorite climb where climbers perform the chimney move to the top of a narrow chasm and then cross over the chasm to finish the climb on a small ledge on the opposite side. Little and Big people all have a fair shot at beating this route. Unconquerable 5.8 – As daunting as the name sounds, Unconquerable is a doable climb with a bit of grit! It is the hardest climb we typically set up. It starts with several cracks and hand holds for the climber to navigate up the rock face. In the middle is the hardest part of this climb! The climber will need to manage getting over a small overhung section of rock. From there the climber will fight tired muscles to achieve the top! Very fun! We find that most groups are optimally challenged on the above climbs. But of course, if your group is looking for more of a challenge, we’ve got plenty of more challenging routes that we can set up for you. Again, please contact us if you have any questions, or are not finding exactly what you are looking for. And you can check out this Wikipedia article for more information about the Yosemite Decimal System for grading climbs.